In China, electric bicycles are leaving cars in the dust. Last year, Chinese bought 21 million e-bikes, compared with 9.4 million autos. While China now has about 25 million cars on the road, it has four times as many e-bikes. Thanks to government encouragement and a population well versed in riding two wheels to work, the country has become the world's leading market for the cheap, green vehicles, helping to offset some of the harmful effects of the country's automobile boom. Indeed, as engineers around the world scramble to create eco-friendly, plug-in electric cars, China is already ahead of the game. Says Frank Jamerson, a former GM engineer turned electric-vehicle analyst: "What's happening in China is sort of a clue to what the future will be." Right now the future buzzes along at a sedate pace. Government regulations limit the top speed of e-bikes to about 12 mph. But manufacturers are building bigger and bigger machines with speed regulators that are easily removed. E-bikes that are basically pedal-powered machines with an electric boost are common in cities like Beijing and Shanghai, but e-scooters with heavier motors and top speeds of around 30 mph, fast enough to rival mopeds, are growing in popularity. The e-bike boom owes much to Chinese policy. The government made developing e-bikes an official technology goal in 1991. Major Chinese cities have extensive bicycle lanes, which means riders can avoid the worst of rush-hour congestion. In cities such as Shanghai, local governments have drastically raised licensing fees on gas-powered scooters in recent years, effectively driving hoards of consumers to e-bike manufacturers. The relative simplicity of the machines and their components has encouraged a huge number of e-bike companies to open in China. In 2006 there were 2,700 licensed manufacturers, and countless additional smaller shops. Rising to the top of the heap is not easy. Leading manufacturer Xinri (the name means "new day") was founded in 1999 by Zhang Chongshun, an auto parts factory executive who recognized the potential of the field. In its first year Xinri built less than 1,000 bikes; last year it churned out 1.6 million. Xinri's Zhang puts in thousands of miles on the road a year, visiting as many as six cities a day to investigate local market conditions. But ultimately what makes Xinri successful is that electric bikes have hit a sweet spot in the Chinese economy. As Chinese grow richer, they want more convenient means of transportation. But not everyone can afford a car. "Motorcycles are too dangerous, cars are too expensive, public transportation is too crowded and pedal bikes leave you too tired," says Hu Guang, Xinri's deputy general manager. "So people buy e-bikes." The company's ads show Jackie Chan riding an e-bike alongside a model in a glamorous European capital. Reality is much more mundane. E-bikes are commonly used by migrant laborers who schlep across town from their quarters in the suburbs to work sites across town, with their drills and saws strapped to their bike racks. Police stations are often fronted by a row of blue and white patrol e-bikes. Delivery workers from McDonald's and KFC haul plastic cases stuffed with Big Macs and fried chicken to office parks. "At first, I picked an e-bike because I couldn't stand the sickening smell of gas from my scooter," says Zhang Dengming, 50, a construction supervisor in Shanghai. "But after a while, I realized that e-bikes are actually much safer than motorcycles, and better for the environment. Although e-bikes are generally slower than gas scooters, I find them fast enough for my daily commutes. Their price, which is typically just over 2,000 renminbi ($290) is also more acceptable, so I don't feel as bad when they get stolen." Last year Chinese bought about 90% of the 23 million e-bikes sold worldwide. Experts say that next regions to likely embrace e-bikes are Southeast Asia, where gas-powered scooters are popular, and India, where rising incomes mean personal transportation is starting to be in reach of hundreds of millions. Japan has seen steady annual sales of about 300,000 for several years, and in the cycle-crazy Netherlands e-bikes are beginning to take off. In the U.S., where bikes are still overwhelmingly used for recreation rather than transportation, e-bike sales are expected to break 200,000 this year, or about 1% of China's sales. E-bikes weren't always so popular on the mainland. Early models were even slower than today's; range was limited and batteries died in less than a year. Now they can travel as far as 100 km on a full charge, more than enough for a day's riding. But batteries remain the weak point. Most e-bikes rely on lead-acid batteries, cheap century-old technology unsuitable for the growing demands of daily commuting. "The battery is the key limiting factor," says Jonathan Weinert, a transportation expert who wrote his doctoral dissertation on electric bikes in China. While lead-acid batteries are improving, Weinart says that electric bikes will create a larger market for lithium-ion batteries  a newer, lighter technology whose development is key for the future of electric vehicles. Already Giant, the world's largest manufacturer of pedal bicycles but a small player in the Chinese e-bike market, has made headway in northern Europe selling high-end e-bikes that use lith-ion batteries. "To the extent that the electric bike industry can help get battery costs down, test the technology and get it in the market, that may lead" the development of electric vehicles with more than two wheels, Weinert says. Chinese market leaders like Xinri and Yadea have partnered with top schools like Tsinghua and Peking universities to improve battery technology. And like a slew of other Chinese companies, some e-bike makers are already working on electric cars. Yadea plans to create electric cars for special uses such as shuttling sightseers at tourist destinations. 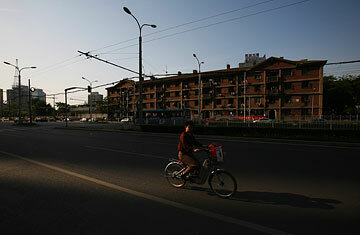 At the 2008 Beijing Olympics, Xinri provided e-bikes and an electric car for use by police at the Bird's Nest stadium. Electric cars will require more powerful recharging stations than the standard wall outlets used to juice up bikes. But when four-wheeled technology becomes road-ready, it will find a willing customer base in China. "The Chinese have a hundred million people on electric bikes," says Jamerson. "That means a hundred million potential customers" for electric cars. When he worked at GM, which filed for bankruptcy on June 1, Jamerson said he once suggested the company give away an electric bike with every new car, just to get customers used to the idea of a means of transportation you plug in every night. His bosses thought he was joking. When the electric revolution final comes, China's e-bike makers could have the last laugh.